Last Thursday evening we had a wonderful event at the School to celebrate the completion of our fundraising campaign to create a distinguished professorship honoring Governor Holshouser. We have raised more than $365,000 and the General Assembly’s Distinguished Professorship Matching Program will provide another $167,000 to create the James E. Holshouser Jr. Distinguished Professorship. Chancellor Holden Thorp and President Tom Ross attended and so did many of North Carolina’s leading public officials, including Governor Hunt and Governor Martin. The campaign committee members did a wonderful job over a longer-than-usual fundraising period. We started the campaign at the beginning of the recession, so our timing could not have been much worse. George Little (an insurance executive from Southern Pines and a long-time leader in the Republican Party) persevered as chair of the committee―he was strongly motivated by his great affection for Governor Holshouser, his best friend. Phil Kirk, another member of the committee, did extraordinary work in soliciting key donors for the professorship. And there were many, many others, including Brad Wilson, President of Blue Cross and Blue Shield, who generously made a significant challenge gift toward the end of the campaign that was matched by Art Pope through the Pope Foundation. 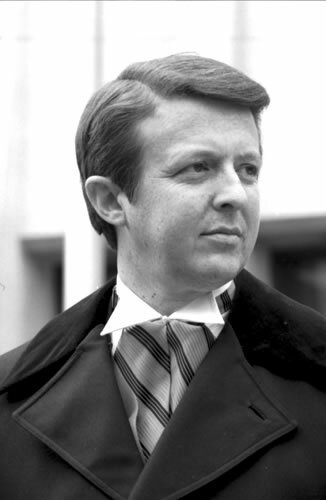 Chuck Neely, a member of our Foundation Board, was instrumental in securing that gift. It is perfectly appropriate that we are able to honor Governor Holshouser because he has been involved directly and personally with the School’s work. In addition to relying on us during his tenure as governor, he has used our services regularly over the years as a county attorney, municipal attorney, and airport authority attorney. I remember the first time I visited Governor Holshouser at his office in Pinehurst, and he kept me waiting in his lobby for about ten or fifteen minutes past our scheduled meeting time. When he came out he had a mischievous smile on his face. He explained the reason for the delay. He had been talking with one of our faculty members, David Lawrence, about a pressing local government law question. He finally had told David he needed to go because he had a meeting with his boss. David’s response was “My boss? Who are you talking about?” Governor Holshouser especially enjoyed sharing that comment with me. I’m reasonably certain it was the first time David had ever considered that he might have a boss, and of course he rejected the idea completely. 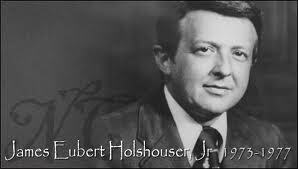 I’m proud that Governor Holshouser’s name will always be connected to the School of Government. No other person is more widely respected for his commitment to North Carolina, and that respect crosses political ideology and party affiliation. He works with Republicans, and he works with Democrats. He is viewed by everyone as fair and helpful. Those are exactly the same qualities that we have tried to promote as the School of Government. Our mission is to work with all North Carolina officials so that they can be as effective and as efficient as possible. We want to work with everyone by providing practical and helpful assistance. We want to be viewed by everyone as fair and helpful. 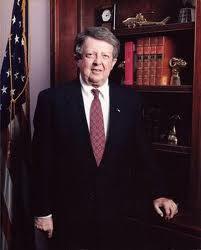 Governor Holshouser is a great role model who always has exemplified the highest integrity and civility. He is a good and humble person. This professorship will serve as a permanent reminder, and inspiration, to follow his example in our work with North Carolina officials. Many thanks to everyone who was involved in this campaign, especially Ann Simpson who did a great job herding all of the cats to the finish line. Norma Houston also was incredibly helpful with ideas and contacts along the way. Thanks to Ann and everyone else who made last week’s celebration such a wonderful event―Becky Carter, Jean Coble, Tatum Isenberger, and Random Gott. Hear, Hear. What a nice way to re-connect the legacy of the regular work of the SOG to a NC governor and whether David Lawrence had a boss. It was indeed a wonderful celebration of two great North Carolina institutions – Gov. Holshouser and the SOG. Particularly fitting was completing the campaign in the year that marks the 40th anniversary of Gov. Holshouser’s election.